Ann had her whole life ahead of her. She had a great track career and a best friend. She had college applications coming up and a whole lifetime of opportunity. Then she met Connor. Ann isn't sure quite when it happens, it was no one point in time. Slowly she gives up sports, friends, fun, future and happiness. But she's happy when she's with him. He's all she wants—he's all she has. I didn't fall in love with the format of this story. I am still a bit unhappy with the whole thing being told backwards, with flashes of present day interspersed. I like the flashes, but I didn't life going backwards. It was just hard for me to keep the chain of events in my mind in order. It is weird watching domestic violence de-escalate. It lends to a happier ending though. Because instead of things getting worse and worse, they start terrible and go back to the way things were before. I really loved how Ann was presented. When you fall in love in high school, that relationship often consumes your life, and you slack on other aspects of yourself. Add that with a boyfriend who is possessive, and Ann found herself alone. It's easy to not really noticing it happening, especially when it's not all bad. It was interesting having to wait to find out about events that had been alluded to as already having happened. 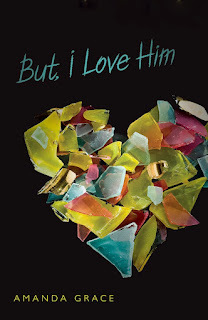 This novel does allow some sympathy for Connor and it is terrible to have grown up as he did. It struck me as odd, that Ann had this bit of anger at Connor's mom for not leaving her abusive husband, but then she stays with Connor even though he's violent. It goes to show that sometimes it'd hard seeing things from up close. I think this is a great resource for teens, maybe someone can give it to a friend that really needs her eyes open. Ann's friend, Abby, tried to warn her about the danger she was getting into, how she was falling away from everything. Ann didn't want to hear it though. Maybe if she read a book like this, she would see some of the signs and similarities and maybe would have gotten out earlier. Definitely a good and intense read. Check it out soon. "I lie in pieces on the floor." "I want to stay up here all night and count every twinkling light downtown, and I want it to never end." Sounds like you have a great job! Thanks for the heads up on what sounds like a good read. I'll have to check it out!